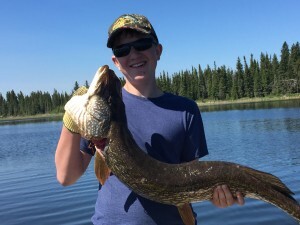 I’m back from the Churchill River lake country northwest of Lac La Ronge Provincial Park in Saskatchewan, from a week of fishing & family. On the flight home I finished Jeffrey Cohen’s new book Stone, a gorgeous lovesong to lithic form, narrative endurance, and the urgent need to connect. A great match of place and book! My favorite thing about Stone is its sinuous form. It’s more slippery than it looks, or than we might generally expect a book (mostly) about medieval literary culture to be. Authors, texts, and intimations swirl into view, vanish, and then return: Isidore’s Etymologies, Albertus Magnus’s Book of Minerals, the history-romance-travel narratives of Geoffrey of Monmouth, John Mandeville, and many others, including the wayward hero Jeffrey Jerome Cohen, whose itineraries take him from Bordeaux to Paris, Scotland, Berlin, and finally Iceland. He’s a good traveling companion, and he travels with good companions. 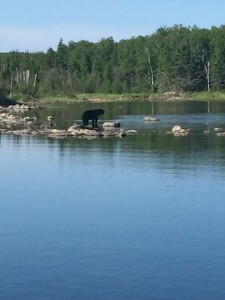 Stone’s slipperiness came home to me last Thursday morning, on our second day of fishing, when my father, braving the north woods in, I’m sorry to report, not quite the right shoes, slipped on a sloping rock getting out of the boat. I grabbed him before he could slide into the deep pool, but it was a treacherous moment: we expect stone to be solid, except when it’s not. Water makes it slick. Stone betrays, sometimes. Academics reading Stone will notice the informal “Excursus” interchapters, which narrate the Cohen family travels to various stoney sites. Stonehenge recurs in each substantial chapter, until the too-familiar stones, which I confess I cannot see in my mind’s eye without hearing a Spinal Tap soundtrack, seem old friends. The careful movement from textual analysis to material ecotheory to family story makes Stone a deeply personal book, and a moving one to read. Early on, Cohen quotes one of my favorite lines from ecotheorist Stacy Alaimo. “If nature is to matter,” he quotes, “we need more potent, more complex understandings of materiality” (6-7). I think something similar emerges as the enduring gambit of this book: if we want academic books to matter (and we should), we need more potent and more personal understandings of our critical projects. More experimental books, please! Not fifteen minutes after fishing my Dad off the slippery rock, I felt a hard thwack on the crown of my head, followed by a sharp tugging pain. I’d been hooked! 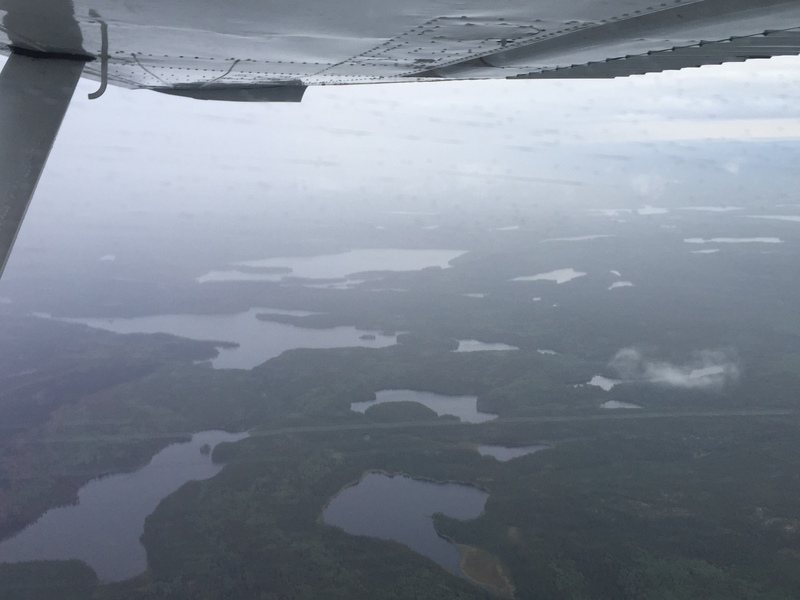 An errant back-cast in a small boat re-routed my afternoon away from the lake to a lodge-bound portage, fortuitously-timed float plane, and rural Emergency Room in La Ronge, SK. No big deal, said the doctor. We pull hooks out of fishermen about once a week in the summer. He showed me a cork board in the tiny hospital where last year’s hooks were proudly displayed, with names and home towns of the anglers. Connecticut would soon make an appearance. Fishing, like stone, abounds with allegories. Perhaps my favorite section of Stone imagines a “zoe-egalatarian ethics” (228), which would reframe Bruno Latour’s “Parliament of Things” to include not just “bare or animal life but a force (call it life, wildness, desire, vibrancy, creatureliness) that is materiality in action” (228). Lithic formations, both those shaped by humans and those unwrought, serve in Cohen’s telling as limit cases that prompt and repay intense thinking: do all stones crave and create stories, as the not-always-hidden former title of this book, “Stories of Stone,” suggests? Or is the case of stone an extreme example of human eagerness to populate the material universe with meanings? In the Stone <–> Story equation, which direction does the arrow point first? 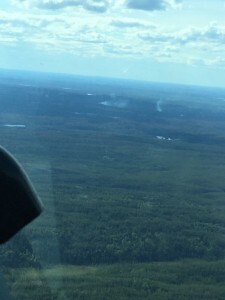 The waterworld of the Churchill River system, which the local Cree people, including our fishing guides, call Missinipe or Big Water, is full of exposed glacial stone, big shallow lakes, and waterfalls, but last week we saw the moving force of fire. Unseasonably hot weather two weeks earlier had been followed by thunderstorms and a lightning fire that burned hundreds of acres, including maybe a half-dozen unoccupied cabins. (Many were winter trapping cabins, unoccupied in the summer, our guides said.) 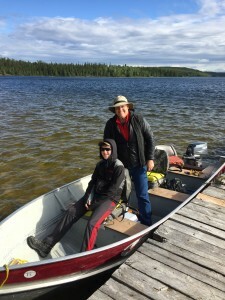 The day we started fishing the fires were out. It was raining and cold, maybe 50 degrees, but on Thursday afternoon the sun peeked through and the temperature started to climb. 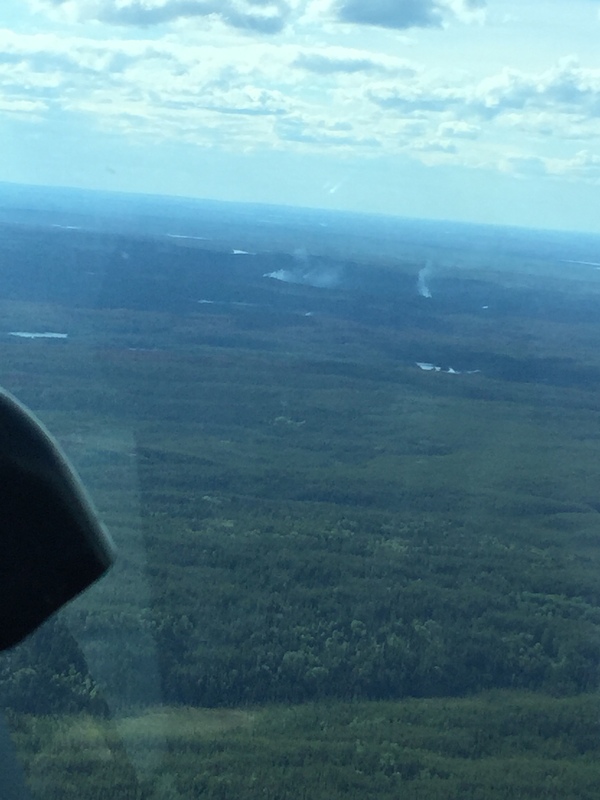 When I flew back to La Ronge to have my head de-hooked that afternoon, I spotted maybe three or four places where the smoldering blaze had re-erupted, sending tendrils of smoke high into the hazy sky. 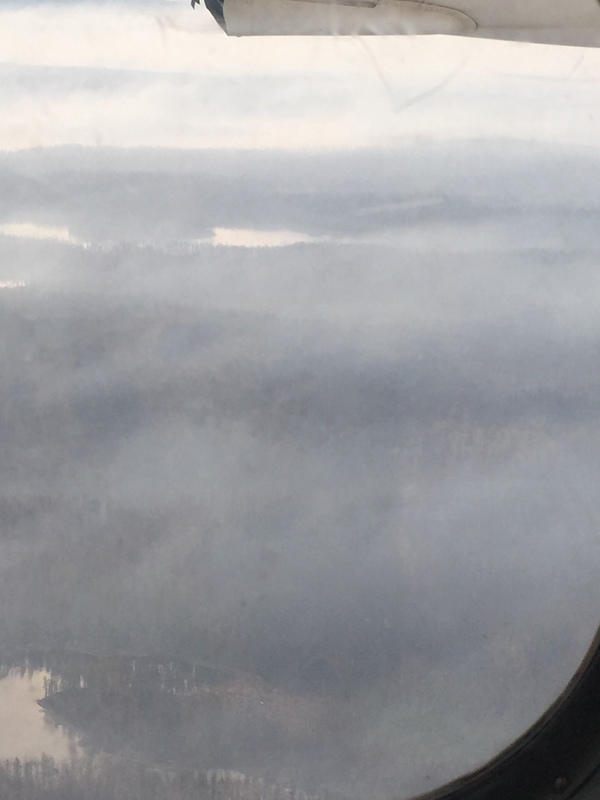 After two more sunny days of fishing, we flew home through clouds of smoke. The water level was down maybe two feet below last year. The fire was back — but such fires, we were told, were common in the summer. Stone exists, in Cohen’s telling, as an “intimate alien” (249), deeply prized and fundamentally opaque. Like the forms of materiality we misname “nature,” stone abides at an angle to human desires, receptive, resilient, and, alas, not always fully responsive. What was the smoke we flew through but a thin layer of rock, a dispersed grit pushed aloft by heat and wind? Finishing the book on the plane into Connecticut Sunday night, I thought about curiosity as an ecological force: fire’s desire to know the forest all the way to the shoreline; a black bear’s desire to know what we were doing, floating in the middle of the lake in a shiny tub; the fish’s desire, which fixes the hook in its mouth; the academic’s unrelenting curiosity, the slow patient unfolding of meanings and connections. Plus of course my own peculiar curiosities, the hooks I flash into so many waters, the smoke and fire and water through which I splash. Humans, formed of clay, are on a basic level “mobile rocks” (222) as St. Augustine reminds us via Jeffrey Cohen. Books are wooden (or digital) versions of engraved stones, passed from hand to hand. “Every stone desires” (239), and even “catastrophe is entanglement” (65). This book teems with lists, questions, speculations, assertions, engagements, flows, collaborators, “appositives” (8) (! ), histories, fictions, and emotions. It’s also, more than any other academic study I can think of, a book about family. Every time Wendy, Katherine, and Alex appear — mostly, but not only, in the personal “Excursus” sections that punctuate and structure the volume — they seem to the reader welcome friends and standing stones, mobile but stable, spinning and moving and dancing. If Stone is about family, it also includes the vast imaginative families that Jeffrey Cohen and his many collaborators have gathered together at In the Middle, BABEL, punctum books, GW-MEMSI, and other venues, permanent or provisional. For the past five years or so, I’m been privileged and inspired to be a wandering early modernist among these mostly-medieval pilgrims. Like northern Saskatchewan, it’s a good place to be. At its core, Stone seems to me a book that risks following metaphor all the way into materiality and seeing what comes out the other side. 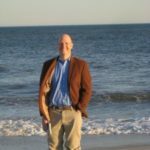 That’s an eco-critical project I’m also invested in, and one that I think needs pursuing in our age of ecological instability and change. Putting my hand to the stitch in my scalp where the hook bit a few days ago, I wonder about comparable projects about fishing or swimming or writing. Academic imagination seeks and finds matter all around us, in a swirl of ecological curiosity and analytical pressure. Empedocles’s answer is still the best one: all things in this world, stones and families and fish and words and ideas, come together and part through Love and Strife.